Jerry Spinelli’s novel Wringer is a realistic fiction book that shows what can happen when one person rebels against a cruel and vile tradition. It also looks at themes of peer pressure and facing your fears. Nine-year-old Palmer LaRue lives in a town that has a tradition where every year, they shoot 5,000 pigeons. The shooters all pay to do this, and the money goes toward a local park. The shooters are scored based on how many they kill. The winner gets a trophy called the Sharpshooter Award. Palmer’s father won the Award back in 1989. This is a tradition that Palmer despises, but the worst part of the tradition is that, after the shooters are done shooting, teams of ten-year-old boys called “wringers” gather up the fallen pigeons, and break the necks of the ones who are not yet dead. Palmer is almost ten, which means that soon he will have to be a wringer, but he does not want to. One winter morning, a pigeon lands on his windowsill and taps on the window. Palmer eventually lets it in and ends up keeping it as a pet. He names it Nipper, and he keeps Nipper a secret from everyone except his friend and neighbor, Dorothy. Palmer’s so-called “friends” start to wonder what’s going on, and Palmer has to convince them that he’s a pigeon-hater like they are: “I hate pigeons! I hate ‘em all! I’m going to be the best wringer there ever was!” But in the end, Palmer stands up against the peer pressure, and his decision shocks and angers, but ultimately (maybe) changes, the town. The story is very similar to the movie How to Train Your Dragon, except it’s pigeons, not dragons. The story is very emotional, and I thought that the description of the way the kids acted in the book was very realistic. Palmer is different, and because of this his life becomes harder, so he tries to hide his difference. Lots of his kids his age would do the same thing. Beans and Mutto, two of his “friends,” are both classic bullies. Their gang is nicknamed “The Beans Boys,” and they are bossy jerks who enjoy harassing people they don’t like. This book is great for pre-teens, because they will be able to relate to these characters. A lot of kids who will read this book will know a kid like Palmer, or know kids like Beans and/or Mutto. Readers will be able to understand the story and why the characters act the way they do better because the characters are so convincing. This is also a great book for animal lovers because Palmer in the end demonstrates himself to be a compassionate and loving person towards animals, even pigeons, which most people think of as pests. 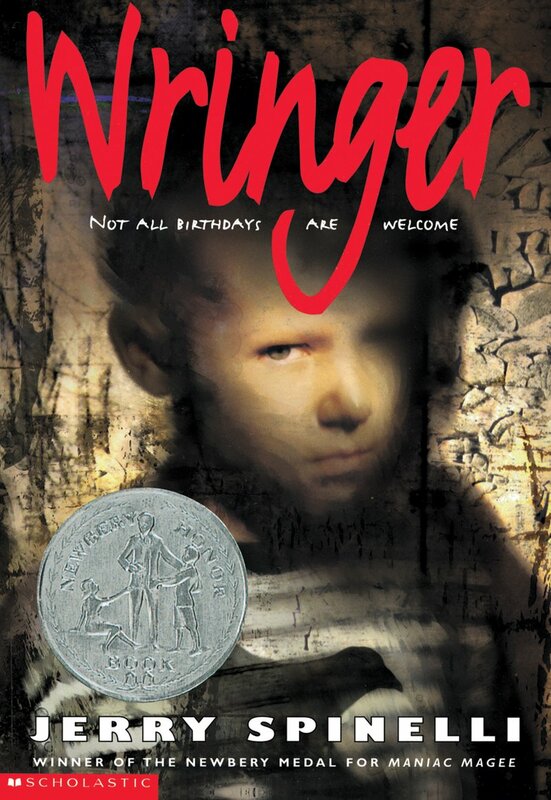 Wringer was a Newberry Honor Book in 1998. Daddy's afterthoughts: Thinking as an English teacher, I think Julia's analogy of How to Train Your Dragon is a good one. If your teacher (or parents, if your kid's teacher) assigns this book, watching that movie first will anticipate the theme of the novel pretty well. There's even a neat little lesson plan/activity packet put out by the Humane Society that focuses on comprehension, vocabulary development, and awareness of animal cruelty.